The Great Dane is a German breed of domestic dog known for its giant size. The record holder for the tallest dog ever is a Great Dane called Zeus (died September 2014; aged 5), that measured 111.8 cm (44.0 in) from paw to shoulder. The tallest living dog is another Dane named Freddy, measuring 103.5 cm (40.7 in). Large boarhounds appear in ancient Greece, in frescoes from Tiryns dating back to the 14th–13th centuries BC. 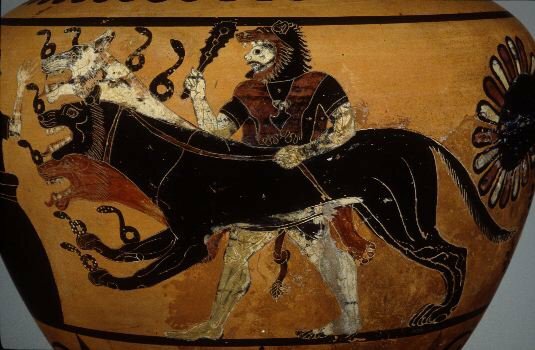 These large boarhounds continue to appear throughout ancient Greece in subsequent centuries up to the Hellenistic era. 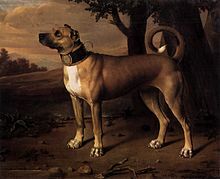 In the middle of the 16th century, the nobility in many countries of Europe imported strong, long-legged dogs from England, which were descended from crossbreeds between English Mastiffs and Irish Wolfhounds. 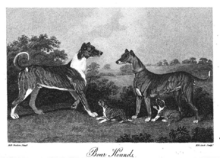 They were dog hybrids in different sizes and phenotypes with no formal breed. These dogs were called Englische Docke or Englische Tocke – later written and spelled: Dogge – or Englischer Hund in Germany. The name simply meant "English dog." Since then, the English word "dog" has come to be associated with a molossoid dog in Germany and France. These dogs were bred in the courts of German nobility, independent of the English methods, since the start of the 17th century. Grey merle (Grautiger) dogs are acceptable in conformation shows under the FCI as the grey merle dogs can produce correctly marked black/white harlequin dogs, depending on the combinations. The aim for deleting the colour grey merle as a disqualifying fault is to provide a wider gene pool. Their status is that they are "neither desirable nor to be disqualified". Consequently, this colour must never obtain the highest grading at dog shows. Other colours occur occasionally, but are not acceptable for conformation showing, and they are not pursued by breeders who intend to breed show dogs. These colours include white, fawnequin, brindlequin, merle, merlequin, blue merle, chocolate and fawn mantle. The white Great Dane coloring is typically associated with vision and hearing impairment. Great Danes are generally well disposed toward other dogs, other noncanine pets, and familiar humans. They generally do not exhibit extreme aggressiveness or a high prey drive. The Great Dane is a very gentle and loving animal and with the proper care and training is great around children, especially when being raised with them. However, if not properly socialized, a Great Dane may become fearful or aggressive towards new stimuli, such as strangers and new environments. The Great Dane, although large in size, is comfortable and well-suited to life in a small apartment, or a large house with acres of land. The Great Dane is a very adaptable breed, known for being "couch potatoes". Animation designer Iwao Takamoto based the Hanna-Barbera character Scooby-Doo on a Great Dane. He derived his design from sketches given to him by a Hanna-Barbera employee who bred Danes, and then endeavoured to make Scooby the opposite of a perfect pedigree, with a longer tail, bowed legs, small chin and a sloping back. The Great Dane was named the state dog of Pennsylvania in 1965, and the University of Iowa had Great Danes, Rex I and Rex II, as mascots before the Hawkeye was chosen. "Great Danes" is the nickname of the University at Albany. Their mascot is the Great Dane. An unnamed Great Dane knocks Jean-Jacques Rousseau to the ground in Reveries of a Solitary Walker; he describes the singular feeling of peace and suspended identity that the shock of the collision brings about in him. ^ Tapio, Marjo (25 February 2019). "Great Dane Standard FCI" (PDF). www.fci.be. Archived from the original (PDF) on |archive-url= requires |archive-date= (help). Retrieved 25 February 2019.